Increasing clouds with showers arriving overnight. Low 67F. Winds SSW at 5 to 10 mph. Chance of rain 50%..
Increasing clouds with showers arriving overnight. Low 67F. Winds SSW at 5 to 10 mph. Chance of rain 50%. Tatia Adams, vice president for global partnerships with Nickelodeon, and Traci Adams, executive vice president for promotions at Epic Records, join Michael Trammel, president of the Hierarchy Pictures Music Group, for a discussion on the entertainment industry at the 68th Annual Southern Regional Press Institute on March 1 at Savannah State University. 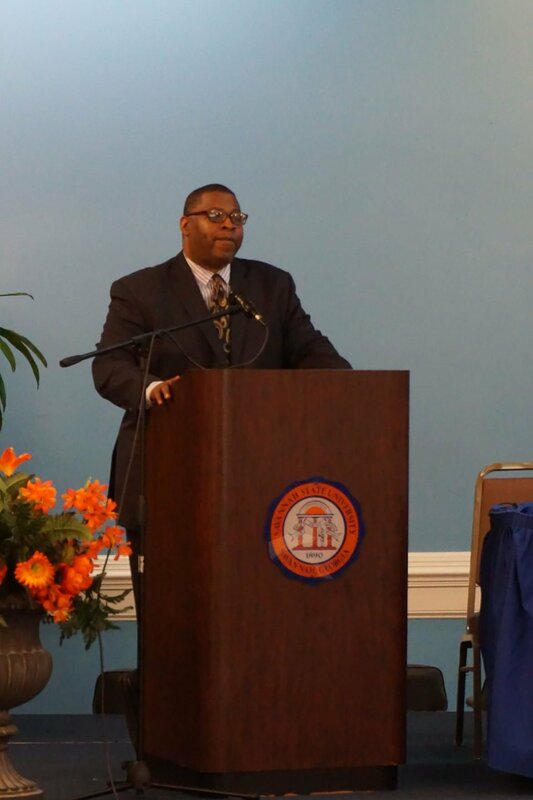 Reginald Franklin, director of the Southern Regional Press Institute, addresses the crowd at the Milledge-Owens Awards Luncheon in King-Frazier Student Center on March 1. (Left to Right) Shantez Herrington, Founder of film is Life Productions; Kareem McMichael, Founder of KARMAC Productions; Weslyn Bowers, Founder of Blessings in a Book Bag, Inc.; and Kaytrina Curtis, Public Affairs Officer for the Winn Army Community Hospital during the Media Entrepreneurship: Diversity in Action workshop hosted by William Martin during g the 68th Southern Regional Press Institute. Weslyn Bowers is founder of Blessings in a Book Bag, Inc. She was one of several people to speak on entrepreneurship at the 68th Annual Southern Regional Press Institute on Feb. 28 at Savannah State University. (Left to Right) Beth Nelson, executive director at the Savannah Area Film Office, William Martin, Director of Programming for WTRT-TV, John Grace, instructor at the Georgia Film Academy and savannah Technical College, and Kareem McMichael, Online Content Manager for the Department of JMC at Savannah State University during The film Industry-Diversity Gradebook workshop at the 68th Southern Regional Press Institute. Reginald Franklin, director of the Southern Regional Press Institute, thanks everyone for a surprise award given to him at the Milledge-Owens Awards Luncheon in King-Frazier Student Center on March 1. He invited the student volunteers at the conference to join him on stage. From the left: Tatia Adams, vice president for global partnerships with Nickelodeon; Traci Adams, executive vice president for promotions at Epic Records; Lisa Paulin, professor at North Carolina Central University; Novella Cross Holmes, former professor at Savannah State University and former director of the Southern Regional Press Institute; and Juliana Trammel, interim chair of the Department of Journalism and Mass Communications at Savannah State University. Tatia Adams, vice president for global partnerships with Nickelodeon, speaks on diversity in the entertainment industry during the session “Diversity Gradebook- Getting In on the Ground Floor” at SRPI on March 1. Diversity is an important aspect to any industry, but especially the media. That was the message during the 68th annual Southern Regional Press Institute took place Feb. 28 and March 1 at Savannah State University. The conference, which is for high school and college students, features multiple workshops on all aspects of the media from film to newspapers. Professionals including 94.1 FM’s Lady Mahagony and the Savannah Morning News cartoonist Mark Streeter were among dozens of people who participated in the panels and workshops over the two days. The institute is scheduled every February at Savannah State by the Department of Journalism and Mass Communications.